Hosts Nepal continued it's dominance in South Asian women's basketball defeating Bhutan 90 - 32 to register their third win in a row of the ongoing first South Asian Basketball Association (SABA) Women's basketball championship. Bhawana Lama netted 21 points for the hosts. Meanwhile Maldives posted their first win of the championship beating Bangladesh 62 - 28 in the third day of the championship. 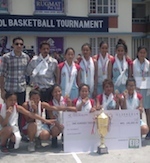 The first South Asian Basketball Association (SABA) Women's basketball championship is ongoing (from March 29 to April 2, 2016) at kathmandu, Nepal with five South Asian nations (Nepal, Sri Lanka, Bangladesh, Maldives and Bhutan) participating. Nepal Basketball Association, a FIBA affiliate, in association with South Asian Basketball Association (SABA) is the organizer of the championship. Hosts Nepal and Sri Lanka off to the flying start in the opening day of the inaugural South Asian Basketball Association (SABA) Women's basketball championship here at Kathmandu, Nepal. In the openning match of the championship, Sri Lanka defeated Maldives 109 - 36 while hosts Nepal defeated Bangladesh 92 - 26 riding high on Sheha Shrestha's 25 points. Earlier Nepal Olympic Committee's president Jeevan Ram Shrestha inaugurated the tournament. The first South Asian Basketball Association (SABA) Women's basketball championship will be held from March 29 to April 2, 2016 at kathmandu, Nepal with five South Asian nations (Nepal, Sri Lanka, Bangladesh, Maldives and Bhutan) participating. Nepal Basketball Association, a FIBA affiliate, in association with South Asian Basketball Association (SABA) is the organizer of the championship.